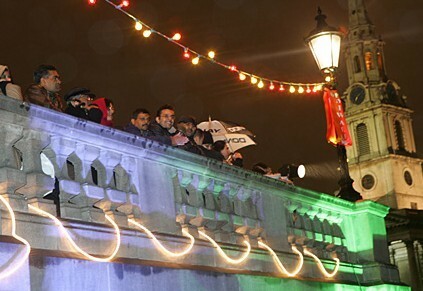 This Sunday, India's glammest festival: Diwali will be celebrated in Trafalgar Square. Diwali is celebrated on a grand scale in almost all the regions of India. Designed to celebrate the victory of good over evil, and "the glory of light over darkness", the word Diwali itself means ‘a row of lamps’ and traditionally homes are lit with the glow of small earthen lamps to welcome Lakshmi, the Goddess of wealth and prosperity. In Trafalgar Square this year they'll be kicking off the celebrations at 4 with prayers for peace, followed by music and dance performances. The "grand finale" will happen at around 8pm. The Mayor's site promises that "Trafalgar Square will be transformed with magical light displays and floating lanterns, a big model of the elephant Ganesh and blessed snacks/sweets". It should be a great sight now the dark Autumn evenings are well and truly upon us, and it should placate (for a few weeks at least) all those Christmas fanatics out there who are already digging out the fairy lights.